Ensure a given name is only present once among the search programs. The search program(s) used to generate the PSMs and associated scores in this search. 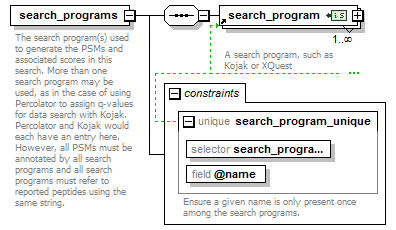 More than one search program may be used, as in the case of using Percolator to assign q-values for data search with Kojak. Percolator and Kojak would each have an entry here. However, all PSMs must be annotated by all search programs and all search programs must refer to reported peptides using the same string.